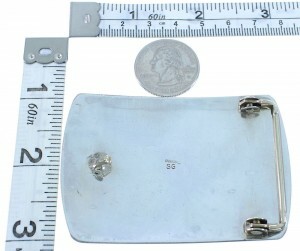 Belt buckle measures approximately 2" long, 2-7/8" wide, will fit a belt that is up to 1-1/2" wide. This is a wonderful piece of Navajo artistry! This piece of Native American jewelry is Navajo overlay hand crafted by artist Stanley Gene out of genuine sterling silver. Overlay is a process that utilizes at least two layers of sterling silver. One layer forms the foundation, while the second is used to design the individual detailed overlay. 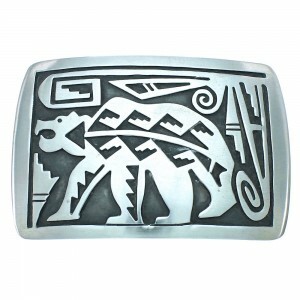 In this belt buckle, the second layer forms a magnificent Bear design, along with other Native American stamped patterns that gives the piece a remarkable finish. In Native American beliefs, the bear symbolizes physical strength, leadership, and is known as the "first helper". The belt buckle is stamped sterling and hallmarked.